I have quite a few house plants, and several plants in the garden that I'm pretty pleased with too. 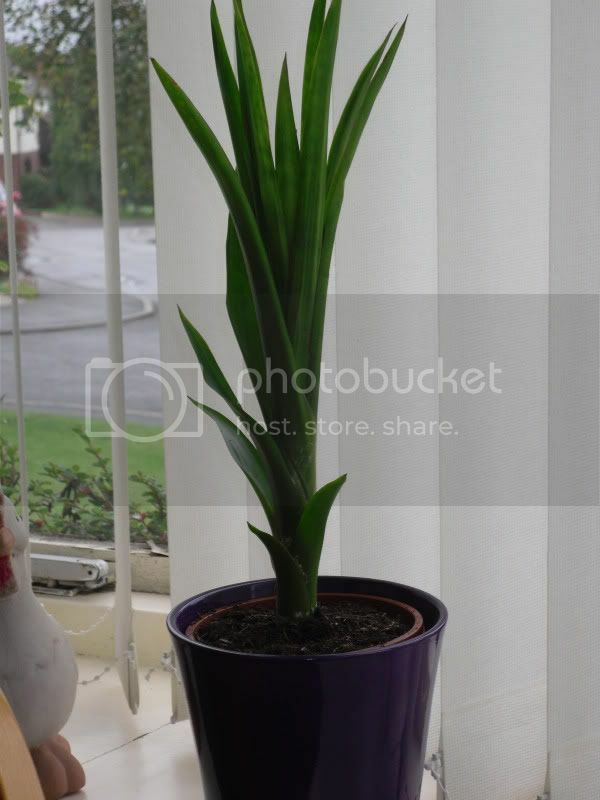 I'll just show off my house plants here though, in case anybody would like one similar and wants to know how to look after it! The plant on the right is one that I'm particularly pleased with because I grew it from a pup. Yes, a pup. It's a type of bromeliad and these plants grow tiny offsets known as pups. My mother plant sent out a load of these little pups and I set about trying to get a few of them to root. The one of the right did! When the plant flowers it should look pretty awesome. Regarding how to look after it, it's pretty easy. Just water into the well in the middle of the plant and make sure it stays filled. Next up I have a Euphorbia. I know, looks like a cactus, right? Apparently, it's not. If you break spines off, it oozes sap. This makes it not a cactus. I think. Now this one is a cactus. I'm just not sure what sort of cactus. Good though, eh? Again, it's now a fair size. My Haworthia is pretty new. I got it from a flower show but I can't actually remember which one. I'm now sure if it's classed as a cactus or a succulent. But it's pretty cool. Again, nice light, little water. It's tiny at the mo, but when it gets big it should look awesome. Now, I know I said 'pretty flowers' and so far it's been all green. But the next lot are pretty. This one on the right is a slipper orchid. 'Slipper' because of the big pouch on the front of the flower. My brother thinks it looks like a bum. I prefer Triffid. The roots on this one go into the ground, unlike the orchids which grow on trees - the moth orchids etc. No direct sunlight for this one, and let it dry out between waterings. More orchids next, my moth orchids. Or 'phals' as they're called. Which is short for phalaenopsis. More light than the paph, but same with the water. I feed them with orchid food every now and then. Once they've finished flowering, cut off the spikes and wait for them to go again! They flower for months and months. 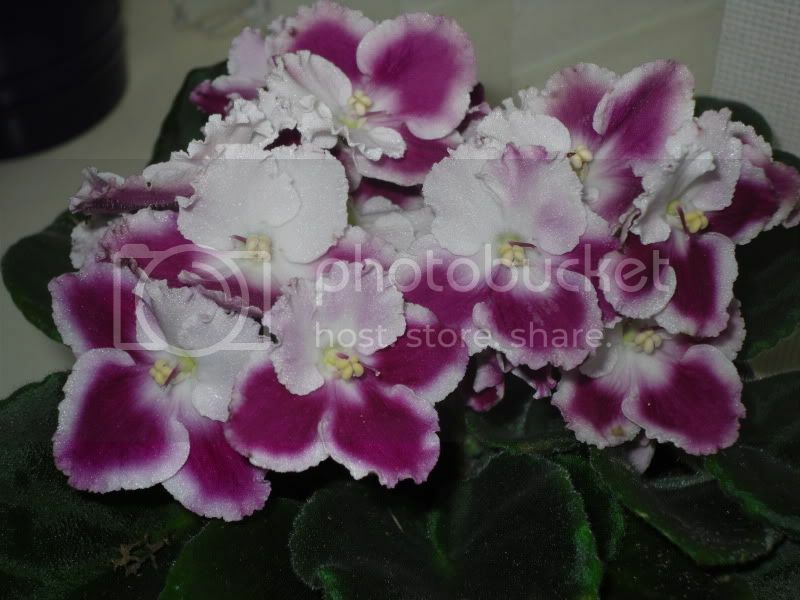 My other flower plants are the African violets. They also flower for ages! I got the purple and white one for my birthday and that was back in May. It's not stopped flowering yet. These like the light, and they also like to be watered, but make sure not to water from the top or they'll rot! Just a bit of water in the bottom of the pot until its sucked it all up is fine. They don't need to be soaking wet, so probably just water once a week. I feed mine too. Plant food, that is. I don't sit them down to meals or anything. My last plant is a polka dot plant (below). Just lots of cool coloured leaves. They come in different colours I think, but I like my green and pink one. I'm not quite sure how to care for it, other than stick it in the window and water it every now and then. Mine has gone leggy, so I think it might have too much light. Or I should prune it or something. Anyway, it's not dead yet! So that's all of them. I think. There's a peace lily too which belongs to my mum. But I water the bloody thing. What I really want is a bat plant... Go google it!